Below I’m going to tell you why I believe that one of the main keys to seeing success with the new Google Shopping platform will be dependable order fulfillment. But before that, let’s start with a quick overview. Back in May of this year, Google announced that it will be phasing out Google Product Search, a highly popular and free comparison shopping engine, with Google Shopping, a paid inclusion shopping engine in which online retailers will have to pay when consumers click on their listings, similar to AdWords. The difference between Google Shopping and traditional AdWords bids is that, with Google Shopping, merchants won’t be bid on individual keywords, but rather on how much they’re willing to pay for clicks or sales by product type or category, similar to Product Listing Ads (PLAs). Google Shopping will now be powered by PLAs, so your ranking will be based not only on bid price, but also relevancy, meaning you will have to have a well-optimized product feed that makes good use of product attributes. Google says that the change from free listings to a paid inclusion model will benefit both sellers and buyers. And while a lot of retailers aren’t too happy about the change, others welcome it, saying that it will help pave the way to higher quality listings, less abuse, and better tools. As a merchant, regardless of whether or not you’re a fan of the change, Google Shopping is something to consider given the popularity of its current shopping engine, and the way that these listings will stand out in Google search results. With the transition from Google Product Search to Google Shopping, this will be the first time that Google has switched from a free product to a paid one. Many merchants have taken full advantage of free Product Search listings over the years, and many will be quick to jump on the Google Shopping bandwagon. Why? Because of the potential for standout visibility in Google. When you look at this page, where do your eyes immediately go? If you’re like most, they go right to the shopping listings with images. Those listings in the top right are examples of Product Listing Ads, and merchants often experience better click-thru rates and even better conversion rates from these types of ads. As an online seller, you’re typically competing with dozens or even hundreds of other retailers. And when it comes to getting traffic and making sales, standing out in Google usually doesn’t hurt. Google Shopping listings will help with this because of their positioning on search results pages, and because of the added features that make them stand out further, such as product images. Now I want to talk about one other feature that Google is likely to add to Shopping listings in the future……Trusted Stores. To qualify for the program, merchants have to first sign up and then spend about a month proving to Google that they’re worthy by providing their customers with reliable order fulfillment and customer service. Many merchants that have been qualified and displayed the badge on their websites have experienced a significant bump in not only conversion rates, but also the average value of orders. So it’s been shown that the Trusted Stores badge can help boost sales when it’s placed on eCommerce websites. And now the question is, what if it’s also placed in search results? From day one, Google has always been about building confidence in its users. Their goal is to serve the best and most relevant results that they can, regardless of what people are searching for. And now, with the rollout of Google Shopping, it is foreseeable that one way they’ll be able to build user confidence is to give preferential treatment to Trusted Stores. 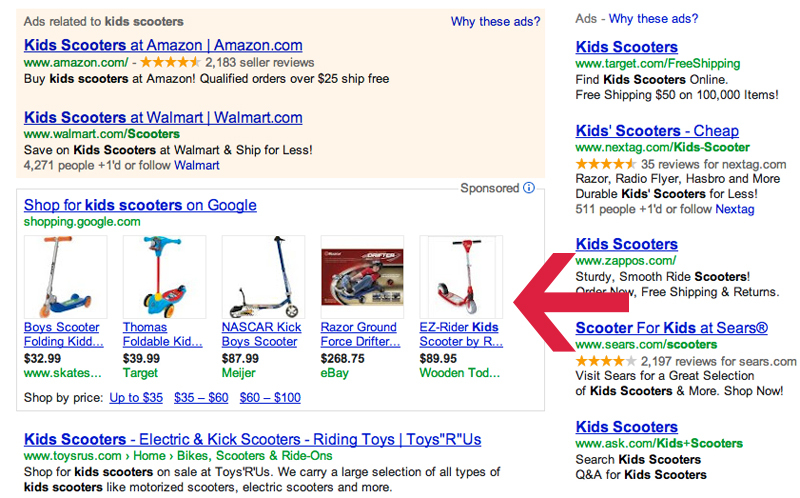 Down the road, I believe we’re going to see Trusted Stores getting better placement in Google Shopping results. If not better placement, I think Google will at least provide users with the ability to filter listings to only show Trusted Stores…and I think many consumers will take advantage. So as an online seller, what can you do? You might think that the first thing to do is to go sign up to be a Google Trusted Store. But in order to qualify for that program, there are some fairly strict requirements. As an example, you must have on-time shipping on over 90% of your orders, and you must have an actual ship date within 3 days of the estimated ship date on 90% of your orders. Before you go apply for the program, you’ll want to first review the performance standards for Google Trusted Stores, and then evaluate your order fulfillment and customer service to make sure they’re up to par. Google Shopping is no doubt going to be a valuable sales channel for many merchants, and I believe that being a Trusted Store is really going to help with this new paid inclusion model. And if that’s the case, since being a Trusted Store is as much about shipping as it is service, I think it’s fair to say that your eCommerce order fulfillment operations will help to dictate your level of success with Google Shopping.